with the Scottish Rite Cathedral, completed in 1924. Built in 1926 at a cost of over $1 million dollars, this building was built as a monument to the ambitions of the fraternity. Designed by Charles A. Weatherhogg, the building stands 10 stories high. This beautiful building was immediately one of the largest structures on the Fort Wayne skyline. At the time of it's construction, over 10,000 members came and went for various meetings, dinners, dances and fraternal functions. During it's grand opening in June 1926, a grand ball was hosted by the Associated Masonic Trustees and all of Fort Wayne was invited. It's said that nearly 3,000 citizens attended that ball. The original plans for the building called for bowling alleys in the basement - although those plans appear to have been scrapped. The building featured two "electric passenger elevators" and a force blast heating and ventilating system complete with thermostatic controls. For decades, the social room was an exclusive gentleman's club where men could enjoy fellowship with their fraternal brothers. The building boasts four separate ballrooms, all identical in size although decorated differently. They are the Corinthian Room, Ionic Room, Egyptian Room and Colonial Room. They are still the largest lodge rooms in the state of Indiana. The building was truly state of the art for 1926 and established Fort Wayne and Allen County as one of the premiere locates in the Midwest for Masonic fraternity. Originally the building shared a causeway with the Scottish Rite building which allowed convenient shared event space. By using the adjoined space of the two buildings, approximately 3,000 people could be seated for a dinner or to enjoy a show. Even by today's standards, it was a massive event space. 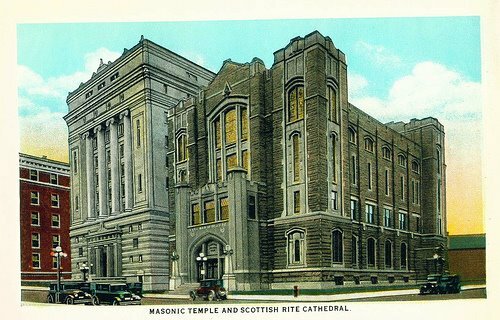 The Scottish Rite Cathedral was eventually used as a community center and finally removed about 1960. Today the space formerly occupied by the Cathedral is a parking lot owned by Freemasons hall. For most of the building's history, it was used exclusively for fraternal events - and many Fort Wayne citizens are still under the mistaken impression that it remains the case. We're pleased to be able to share these historic facilities with the community of Fort Wayne. Your rentals are vital to our on-going efforts of building preservation and allow us to make many important facility upgrade.